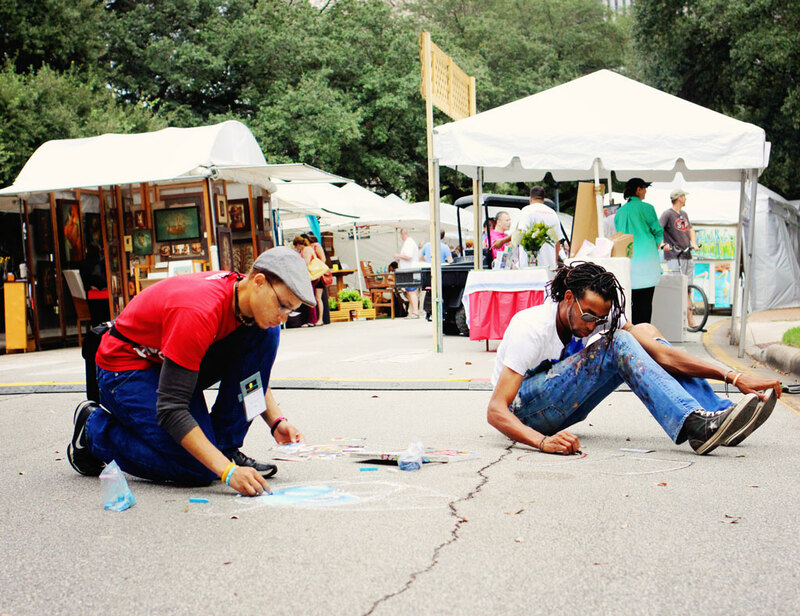 There is nothing like taking a stroll through an art festival!! It makes my heart race…as I walk through the booths and my eye sees all kinds of wonder. The talent of some of these artists is just amazing. I even bought my FIRST piece of Texas art! We will get to that in a minute. One of the things that intrigues me most, is being able to watch them create their art right before your eyes. 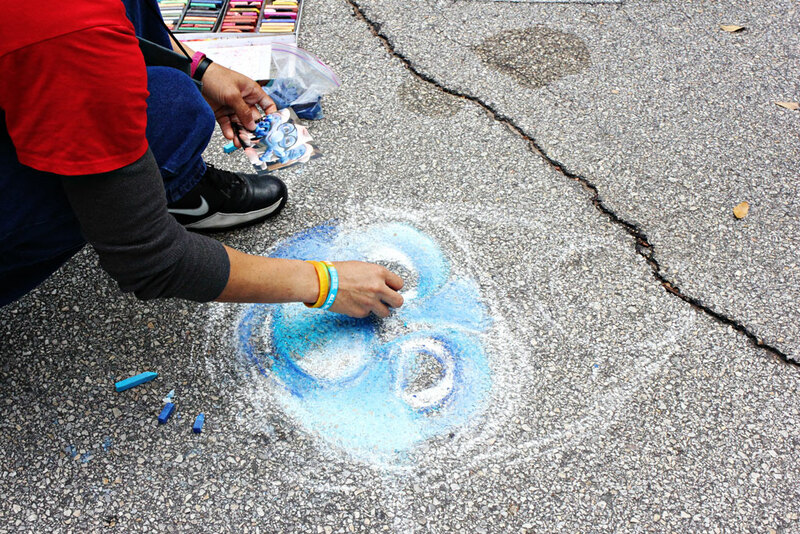 There were several chalk artists on hand, they had several photos to pick from to create for the crowds. I had all good intentions to take these photos, then come back at the end of the day to capture the finished product. Just as we were done with our shopping, we started to head back to see what all they had created and the sky opened up and the downpour began…sigh! Isn’t that just the way?! So these images will have to do. Can you tell what he is creating?…A Smurf! My girls LOVED the Smurfs, when they were growing up. How about yours? This is the photo I couldn’t wait to show you. Here, where we found a jewel for our home. Can you see it? I attached an arrow to the aqua glass art so you could tell what one I bought. I am just in love with it!!! intricate and gorgeous pieces of art…it was very hard to make a decision. And wouldn’t you know it, as soon as Tarzan and myself found this booth, so did half of Texas…smile. So you couldn’t wait to long to make your selection…everybody went crazy and was grabbing their pieces. I waited awhile for the crowd to disperse, to take this picture so you could see at least some of the creations. Finding something unique for your home is just the best! Have a great week my friends. Totally irrelevant here, but I meant to say that I love pink grapefruit 🙂 A happy week to you too, Laurie! 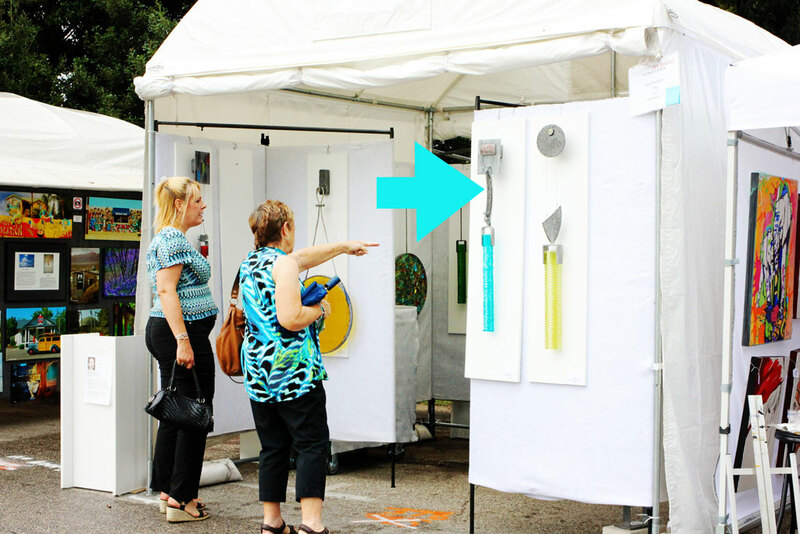 Art fairs are so much fun! I always enjoy these sort of festivals. fun Laurie, looks like you bought something from the best of show! Did you have some chocolate covered strawberries? 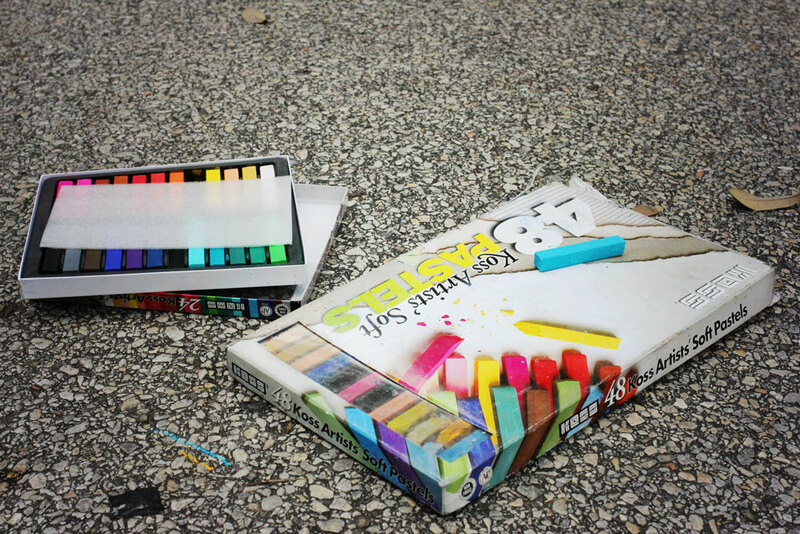 🙂 Love street artists who can use chalk as their instrument but I always feel bad that eventually it will rain on their beautiful creation. Oh no the art work!! Looks like a fun day none the less! How fun! We used to go all the time as kids. I did go a few years ago when it was in Memorial Park, and my husband and I both found something to bring home. Love the addition of the chalk artists! Thanks for sharing. Thank you KiKiMac for your lovely thoughts and for stopping by! This is what you get for being a famous blogger and trend setter… half of Texas is watching to see what you are going to buy… you have to be careful from now on! The artwork you purchased does look unusual… I bet it will be a conversation piece in your home. I have to agree… Nothing better than an Art Festival to get the old heart racing. That is a Beautiful piece you bought.. Fabulous photos my friend. Now that’s what I call “street art” literally. Nice piece, can’t wait to see where you hang in at home. That was so cool to be able to see those artists create in front of your eyes. Strolling to see these beautiful creations will be hard to resist. Thank you for sharing. 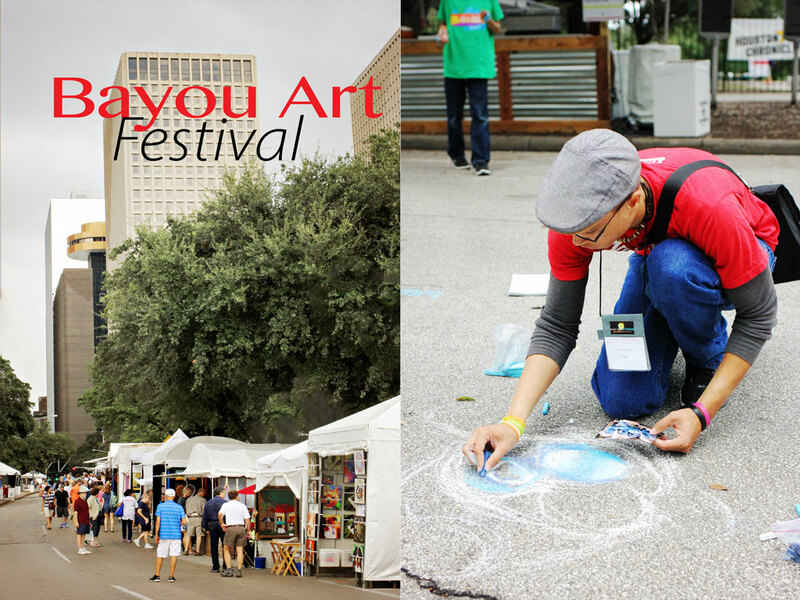 Very cool … reminds me of ArtFest in downtown Fort Myers – only the buildings are SO much taller in Texas! Sounds like loads of fun! I enjoy festivals like this. There is always such a lot of beautiful pieces on display. What fun! I like your choice for art. And a beautiful day! Really enjoyed the pictures, Laurie. Looks like great talent and a shame about the rain. Love the artwork that you purchased! What fun, you love our piece we bought! Just our kind of event! 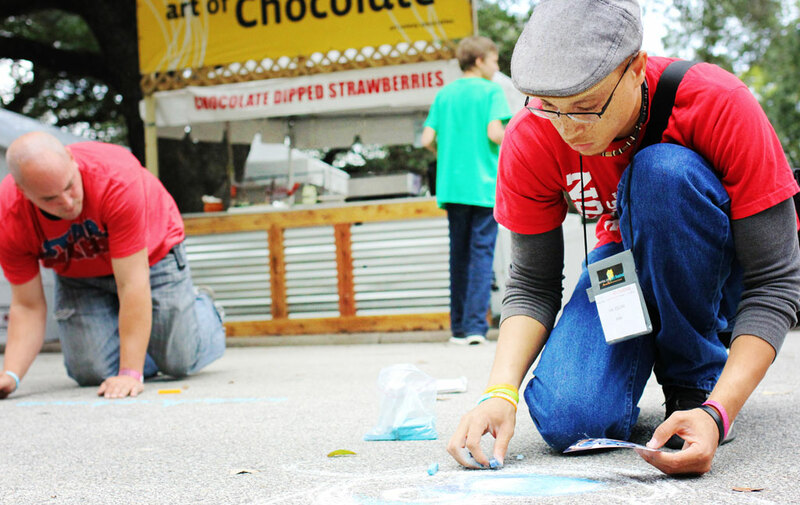 We love tents filled with art as well as sidewalk art. (Both the artists and the creations are fascinating!) Great pics. I know, they are so delightful aren’t they? Dina, I am so glad you liked what we bought. I just love art festivals! The new piece looks way cool. Thank You Tamar. I just love my piece of art.